There are Christmas lights and decoration, and there are crazy Christmas lights and decoration. But when it comes to the Richards of Cranberry, we're on a totally different level – the next level, to be correct. The Australian family has reclaimed their Guinness World Record by stringing up 502,165 twinkling bulbs around their residential property. That's more than half a million Christmas lights on a single suburban home. 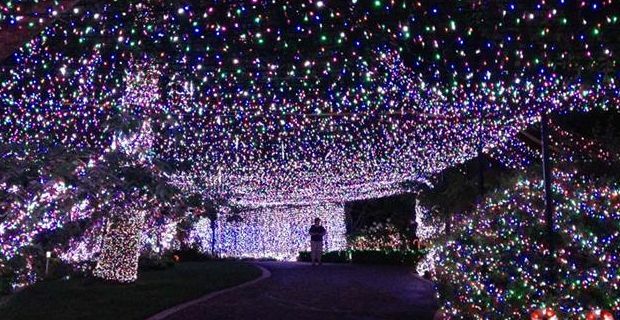 It's not the first time the Richards manage such a feat: the same family in fact entered the Guinness book for the first time back in 2001, thanks to a lush display of 331,038 lights. Last year, however, a family from New York dared stealing the title and scene decorating their home with 346,283 lights. This year, father-of-three David Richards decided it was time to set things straight again. Hence the amazing number of twinkling light bulbs, deployed along 31 miles of wire. Mr Richards told reporters he had started working on the display in October: "I took a week off in the October school holidays and then have worked every weekend since," he explained to the camera in front of his incredible work. Chris Sheedy from the Guinness World Records office confirmed on Monday that the Richards family of Canberra set this year record for Christmas lights. Needless to say, the whole family was well chuffed about it, although not the same can be said about their neighbours: although most of them reportedly support the display, some haven't spoken to Mr Richards since the last record was set. Neighbours' concerns aside, another downside of the majestic Christmas light display may be its cost in electricity. Luckly, has been reported that a local power company will donate the estimated 2,500 Australian dollars (£1,450) in electricity for keeping the display illuminated all the next month. The Richards home in suburban Forrest has been open to the public from last weekend to raise money for a children's charity.